Rated 5 out of 5 by wolf_hounds from MURDER-MAYHEM-MYSTRY-OUTWIT-OUTPLAY - FUN !!! Wonderful game . Great Series. Good varity within the HO's Good story, and required problem solving .Very engaging. Rated 5 out of 5 by JustTheFacts from BONUS CONTENT REVIEW! SPOILERS POSSIBLE! BASED ON COMPLETED GAME BONUS CHAPTER This is as good as the main game, even better if you like a more serious challenge, because I found the puzzles in this part of the game harder. The story is an offshoot of the main one that is played with a different character and occurs in the story while you are elsewhere. Very nifty. Was a bit disconcerting at first, I wasn’t sure what I was witnessing! It took me well over an hour to play, and that includes a more extensive use of hint and skip than my norm. Most of the HOP types are represented, and there are plenty of new puzzles as well as a whole new “movie” to experience. One hilarious glitch was such fun I wouldn’t want it fixed. At one stage all you can see of a person supposedly in full view is his forearm gesticulating in synch with his voiceover. STRATEGY GUIDE Okay. In some cases, I would have liked a more detailed explanation. COLLECTIBLES The collectible clapper boards (49) are not as easy to find as you’d think. They are fairly visible, but it’s the remembering to look that’s difficult, because there’s so much more to do. There is a clapper board indicator in the bottom right that shows if you have found the one in this location yet. Likewise the morphing objects (15) can be found in the HOPs, and an indicator shows if you have found it or not. You only get one shot at them, because the scenes aren’t repeated. ACHIEVEMENTS Everything from doing the tutorial to watching the credits. The 18 awards are nicely presented as thumbnail images on the movie screen. Achievements include completion of the extras games as well. Even an award for replaying the HOPs to a certain standard. SOUVENIR ROOM The souvenir room has a single item from all the locations and you are taken back through each to find it. Its image is shown in the lower left corner. I found this part of the game the easiest of all, even though some souvenirs are actually hidden within the location. GALLERY Wallpapers (8), Concept Art (8), Photo Sessions (16), Videos (18), Music (20). No wonder the game remained fresh even after I’d been at it for hours! I’ve never seen such a long list of sound tracks. MAKING OF This is not just any old home video we’re talking about. It is a game in itself, which you get to play with the actual Final Cut team! They are full of surprises! I really love these people. REPLAYBLES Puzzles (32) and HOPs (15). The HOPs constitute another game, because you can play them to achieve perfect scores no hints, getting the morph and time and accuracy scores, expressed as up to 3 crowns, and there is an achievement for that as well. You can find the morphing objects in the replayable HOPs, and the places you still need to find them are indicated by a highlighted jigsaw puzzle piece. This is a top notch complete-package bonus content. There is something for everyone and several hours’ worth of playing available, even after finishing the main game. Rated 5 out of 5 by Penhip from THE FILM NOIR OF ADVENTURE GAMES… IN COLOR! EIPIX AND BIG FISH HITS ALL THE RIGHT NOTE WITH THE LATEST INSTALLMENT OF FINAL CUT. AMAZINGLY CREATIVE HOS, THAT ARE CLEAR, WELL LIT, UTILIZING INNOVATIVE AND CLEVERLY INTEGRATED APPROACHES IN GAMING. THIS GAME SUCCEEDS AT EVERY LEVEL. WITH WONDERFUL CUT SCENES THAT PAY HOMAGE TO THE GREAT ERA OF CRIME IMMORTALIZED BY BOGART AND CAGNEY ENHANCED BY APPROPRIATE MUSICAL SCORES, THE STORYLINE PICKS UP WITH MORTON WOLF'S ALTER REALITY PROJECTOR NOW IN THE HANDS OF A SERIAL KILLER. HIS DAUGHTER IS ONCE AGAIN CHARGED WITH COMING TO THE RESCUE AND PUTTING THE PIECES OF THE PUZZLE AND RELATIONSHIPS TOGETHER. ON A TECHNICAL LEVEL ADVENTURE GAMING DOES NOT GET BETTER THAN THIS - THE MAP WAS FLAWLESS ALLOWING YOU TO TRAVEL TO AND FROM LOCATIONS SEAMLESSLY AND THE GAMES WERE ENGAGING AND FUN. I THOROUGHLY ENJOYED THE CE VERSION , WHICH HAS SOME UNEXPECTED AND DELIGHTFUL SURPRISES WITH IT'S INTRODUCTION TO EIPIX STAFF AS WELL AS THE OPPORTUNITY TO GO BACK AND WIN ACHIEVEMENTS BY FINDING HIDDEN CLAPBOARDS AT EACH LOCATION, MORPHING OBJECTS, SOUVENIRS, ETC. THAT WERE MISSED DURING THE GAME. I HAVE NO BETTER COMPLIMENT THAN TO SAY I PLAYED THE GAME FROM START TO FINISH AND REMAINED IMPRESSED THROUGHOUT. GREAT JOB EIPIX AND BIG FISH!!! Rated 5 out of 5 by katnap123 from Bravo!!! Rarely do I buy a CE, but in this case I'm glad I did. This game is totally original and extremely well done. The SE works as a stand alone game, but the CE just adds more dimension to an already great game. There's not much that hasn't already been said about this game. I agree with others in saying that Final Cut Homage can be a contender for 2014 Game of the Year! I applaud the devs right back! Rated 5 out of 5 by Wigi from An Oscar Winner For Me Great game, long, challenging, interesting. Recently played the earlier games but this outclasses them both. Loads of extras, morphing objects in the HOP scenes are hard to find which is great as well. Lovely unexpected scenes, you never know where the projector is going to take you next which adds to the fun. Best game I've played for a while. Rated 5 out of 5 by skullfun from Final cut 3 is outstanding!!! 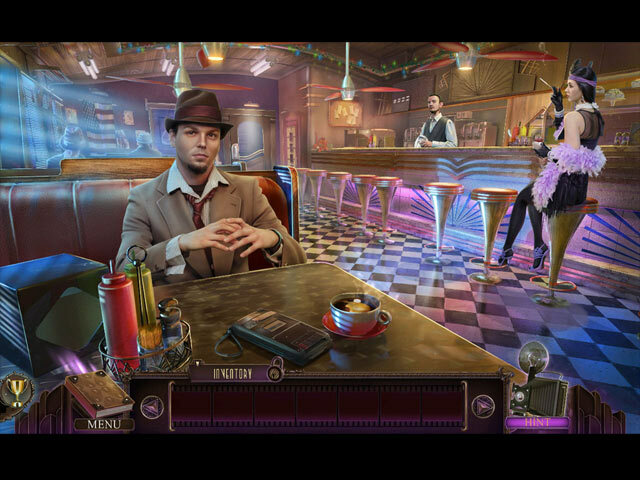 5.5 stars Eipix really hit the mark with this thrilling suspense HOPA mystery. Homage picks up where Encore ends, and this is during the first minutes of play. You don't need to play the previous editions, but you'll want to. This is a true CE in every possible way.The bonus game explains the conclusion. Excellent story, voices, realistic cut-scenes, and graphics. I love the sound of the projector as you switch scenes during progression of the adventure. In the extras you get to play a game which allows you behind the scenes at Eipix. Kudos to Bigfish and Vladimir Zivkovic for this masterpiece. I really loved it. Rated 5 out of 5 by cheshirerose from Really fun game If you have played the other games in the series you pretty much know what to expect. I love the straight forward mystery/detective genre with no ghosts, goblins, curses, amulets, etc. I get really tired of the same old plots over and over - not so with this one! Original storyline, interesting characters and, most important, really fun gameplay. Don't skip the credits - even without the achievement awarded for watching them they are well worth it ;-) More like this please!! Rated 5 out of 5 by Torpedo1 from Can Not Believe it I am surprised that so many games all ready that are great contenders for year of the award. I love HO's and this was the best ever. HO's inside of HO's and morphing objects inside HO's. The characters were slightly Corney but hey great story line and I was drawn into it all. I own the other Final cuts. This goes on my must buy list. One of the best game plays for final cut and my second favorite one of the year. Have to buy this one now. Rated 5 out of 5 by desertsombra from Awesome I was addicted to this game from the start, This is the best of the Final Cut series. Everything you want in a game and more. Intriguing story, wonderful new puzzles (Rabbit/carrot cube), silhouette and HOPA hidden object combined, regular HO games with morphing objects, 45 clapper boards to collect (some very well hidden) and achievements to earn. With the weekend special, it was a wonderful gift from BFG. So for those of you who got hypnotized and bought the game , enjoy enjoy!! Rated 5 out of 5 by hislamb2 from AWESOME!! Can't wait to buy! Loved the story line and graphics and all the great stuff. Thank you... A great-grandma. Rated 5 out of 5 by MSBAM100 from Morton Wolf's legacy lives/dies on! This is the third in the Final Cut series, and each one seems to get harder! The cut scene in the beginning kind of sums up the first two adventures, with daddy dying and crazy half-sister trying to kill your brother Frederick. Your dad's invention, a projector that switches between reality and "movie mode", is almost a character in its own right. You play the normal daughter of Morton Wolf, who receives a package while meeting with a reporter who tells you about a serial murderer called "the Director". Golly gee, guess who your package is from? The Director plans to kill your friends and family if you don't go back home and be in his movie, using your father's projector, of course. So you figure out how to get the car to drive you home, and the nosy reporter comes along as well. When you arrive, your gardener is wrapped up in a scene from one of your father's movies - he thinks he's a pirate. One you repair the projector, you flip back and forth between the movie set and your foyer, trying to figure out how to save the gardener. You must concentrate here, or you'll get yourself confused! The pirate movie, I am sure, is only one of many where you'll have to save someone. There is so much to do here! You have a map -- the one poor feature of the game. You also have your hint button, and four modes to choose from, including custom. The HOS are interactive lists, or silhouette lists that require you to interact with almost every item to get the next item. And they are not easy -- I had to use the hint button a few times to figure out what I needed to find in order to get the silhouetted item. The mini-games are clever and fun. You have to move a rabblit through a maze that turns upside down and sideways until you get to the carrot. Another one makes you guide a phonograph needle through a maze on the record. Plus, there are 49 clapperboards well-hidden in each scene, but I love the fact that an icon shows if you've found the one in that scene yet or not. It helps me remember to look! There are also 15 morphing items that also have an icon that shows up -- I found one in a HOS. There is a souvenir room, that shows up after you finish the game and the bonus game. In previous games, there was one additional item to be collected in each room, that gave you a final picture of what you'd accomplished -- fun and easy to do. Additionally, there is the bonus game, the strategy guide -- useful for finding clapperboards and morphing objects, I suspect. There is also the "making of" feature which in previous EIPIX games was about 50 pictures of the developers at work - and play. All the other CE bling is present as well. I played the previous two adventures as SEs, but this one is so special I will have to purchase the CE. Rated 5 out of 5 by tesamoine from Very enjoyable game There is something about Eipix games that I absolutely love, this being no exception. I think this is the best of the "Final Cut" games thus far. The HOS are varied and require thought. I love the puzzles created by this developer. They are actually fun and tricky, and I am not a puzzle lover. There is a serial killer loose and you are out to find him before he destroys the rest of your family. You have a side kick reporter with you (I actually could do without him, but oh well). The game requires thinking. It is not linear and if you play in the difficult mode, it is a real thinking game. I love the way their games center around the story, the HOS are about the story, the puzzles are story-related. None of this side fluff nonsense here. I highly recommend this, and with the sale (even though it's NOT half off membership price) I shall be purchasing this one. Have a wonderful weekend And, as an afterthought, the music is wonderful !!! Rated 5 out of 5 by hazelwize16 from OUTSTANDING GAMEPLAY! Based on demo ... i am downloading the full game now ... i LOVE the interactive gameplay ... the variable HOs and puzzles ... i absolutely LOVE the FAST PACE! ... i am easily bored and frustrated when a game does not MOVE! ... the graphics are spectacular and the voiceovers are WONDERFUL! ... thank you EIPIX for the game and the cursor that WORKS! ... ANOTHER WINNER! Rated 5 out of 5 by Magda640 from How great is this game? Really! This is the third installment of the Final Cut series, and it is even better than the other two! This is a game that is worth buying the CE. I enjoy games that have an actual storyline that makes sense, as this does. The characters are well delineated; the HOS vary between silhouettes and named items, or you can choose to play a match game if you tire of hidden objects; the scenes are well lit (good for those of us with older eyes). I was too involved to remember to hunt for morphing items (I accidentally found a few), and all of the clapboards, but I will try to keep them in mind for the next time I play. Don't be too quick to click on messages from the Director, because you won't be able to read them again. I play on Casual the first time through, so I don't know how difficult this game can be. One last thought: ALWAYS watch the credits for games from this developer, because they are very amusing. They also mentioned that there will be another Final Cut game coming. Can't wait! Rated 5 out of 5 by rosekaufmann from GOOD AS IT GETS Since others have told the skillful story, I'll skip the details. Customizable. Creative. Fun to play. Non-linear. Flawless gameplay that is quite challenging. Silhouette progressive HOS as well as lists; objects are very well hidden but with good visibility. Good variety of puzzles with varying degrees of difficulty. Many require more than one step. Objects found to help you progress are used fairly close to where they were found. Many locations with a fast-travel map. Diary with pictures and notes. Clapboards are well-blended into their surroundings. Well-developed and carefully crafted environments - graphics are crisp, colorful and finely detailed. Good length. Rated 5 out of 5 by biscuitsmama from Lights, Camera, Action – An Awesome Final Cut and Well Worth the Wait Final Cut Homage is the third game in the series and in this offering we are on the tail of a serial killer who is obsessed with our father and his films and who as such is after our family. As our suspect says in the beginning cutscene he is tired of being an extra and wants to “star” in the drama of his creation. With the help of an ally in the person of a reporter, will we be able to stop this killer and save what is left of our family? The graphics are excellent with the same art deco design and scenery of the two previous games in the series. I love the voiceovers and the creepy voice of our serial killer who taunts us throughout our adventure. It is unique that this game uses a combination of live actors along with their animated likenesses. I really love the way this game has been presented both in graphics and sound. As with the other two games “the projector” serves as our link between reality and the director’s creation. All I can say is that I am so impressed with the talent of this game developer who has presented some excellent games over the past year or two. We have a diary that contains our notes and objectives as well as a map that we find early in the game. The way we navigate in the game to various locales is with our car but I’m not going to mention how it works because part of the fun is figuring out how to navigate. There are various types of interactive HOPs, some are the standard list type and others are silhouette type. What is unique is that there are HOPs within HOPs and the types within each can vary. Although we have seen these types of HOPs before they are done so very well in Final Cut Homage and add a whole new dimension to HOPA games. Then we have the puzzles which are terrific. Although I didn’t find a lot of puzzles in the demo, the first one was such an excellent maze type puzzle that it had me doing my “happy dance.” I just hope that the puzzles continue to be as much fun in the rest of the game. 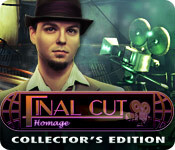 In this the CE version of Final Cut Homage, there are achievements to be earned as well as collectibles to find. Once we find all of the collectibles we can find out how to use them at the end of the game. The remainder of the CE content is standard fare with nothing exceptional in the package. That being said, this is a game that I feel is definitely CE quality by recent standards and one I don’t want to pass up. In the end, this is a spectacular game and the best of the series, IMHO. Although I enjoyed the first game, I wasn’t thrilled by the second one but this third offering has captured my interest, not only in the story but with the gameplay itself. Thumbs up and kudos to the team at EIPIX who has presented a wonderful new HOPA adventure for our enjoyment. As always, I recommend that you at least try the demo to see if this is a game you will like. Rated 5 out of 5 by pennmom36 from The Star Of The Show The drama never seems to end in the Wolf family. Daddy dies, illegitimate half sister tries to kill your brother, things are stirred up once again with the Lieutenant pulling the strings and now we have a deranged serial killer trying to pay homage to the late but great inventor of the movie projector that blurs the line between reality and fantasy. He calls himself the director and he taunts you with insane recordings of his intentions, to make his film a work of art, with you as the lead character! This Collectors Edition has so much to offer: Music, Movies, Pictures (taken with your camera) of course a Bonus Game, Mini games unlimited, HOP unlimited, Souvenirs, Clapperboards (49 hidden throughout the game) and one I'm actually looking forward to, The Making Of feature which is available after the bonus game. Not really sure why, but I love seeing how the game comes to light, the people responsible, it's geeky cool! There is one feature in this game that I wasn't crazy about, the Map. You have to click on the map, then click on the area you are in such as mansion, then click on the circled room to travel there, I know I'm being picky, but I could have computer generated walked to that area by the time I get done finding the area on the map that I want to travel to. At the beginning of the game, we meet up with a journalist who tags along to write the ultimate behind the scenes story of the "Director" as his homage unfolds. The journalist seems a bit fishy to me, he quickly disappears as soon as the Detective arrives, so we had better keep an eye on this enthusiastic sleuth. As I said before, there are 49 hidden clapperboards in each scene so don't forget to keep your other eye on the lookout for those, especially if you want to earn all of the Achievements available. Mini games are well done such as guiding a rabbit on a labyrinth maze box until he reaches the carrot, but some areas make sections of this box rotate as you are traveling along the maze paths to the side of the box, the maze will then rotate to the next side of the box and so forth. Now my favorite part...the Hidden Object Games, extremely well done. The HOS are a mixture of interactive list finds and finding the items that match the silhouetted shapes, but, each HOS has a place to zoom into for yet another window sized hidden object scene for even more finds! The Director has staged exact replicas of Mr. Wolfs most famous films, starting with your house, he is using the projector that makes reality into fantasy, making whoever looks at the projector believe they are indeed a pirate or whatever the projector is playing. You will need to switch back and forth from film to reality in order to find items in reality to use in the fantasy film and visa versa. This is an excellent ongoing saga, usually big hit games such as Final Cut, can't keep the momentum going for a second game so kudos for pulling off three great games, enjoy! Rated 5 out of 5 by BFGMCFFAN from Final Cut 3 - The best game for 2014? I love Eipix and their flagship series Final Cut, but this third installment is even better, than my highest expectations. There weren't much games beside the popular MCF franchise, that were that great! The storyline. You play Ms. Wolf again and this time a serial killer hunts your family. Every victim is sentenced to death in a place that looks like one of Morton Wolf's movies. The serial killer, called "The Director" plays a dirty game with you. He knows always what you do and follows you, while you try to save your family members in time, and talks some crazy nonsense about art makes immortal. I really love such mad personalities. While you are hard at work to save your family, the reporter Michael Harris is at your side to get the story of a lifetime, like ha sais. But can you trust him? Or the detective, which hasn't got the best name as detective. Find it out, I don't want to spoil who's behind the Directors mask. The graphics are wonderful. They are winter / christmas themed, which is not perfectly fitting for the beginning of spring, but for the game it's perfect, because you'll also find a ship within a foyer and a beach within a house and more crazy things, because of Morton Wolf's projector projections. Every scene is nice done, with lot's of details, like in every Eipix game. The music is wonderful, some classic tracks from the first games were combined with some new ones in a wonderful way. When the Director speaks, there is an adventure theme that makes me want to catch that wicked man. Very well done and the right music in the right situations. The characters are life actors, with drawn faces, there are voice overs, which fit to the persons character. There are many persons you've already seen in FC 1 and 2 back in this third part. The level of challenge is quite ok. It's not perfect, but in comparism to the other Eipix games it went up a bit. There are new puzzles, very different types of HO's. And sometimes two types of HO's combined in one. I've never seen that in a HOPA game before. Very creative! The gameplay is fastly going forward and could be a bit more challenging, with more running around and more things you have to keep in mind for some time until you find a useful item to do an action. But even that's better now if you compare it with the latest Eipix releases. There are 15 Morphing Objects in the HO's and 49 clapperboards to collect while playing. The MO's are hidden well and the clapperboards are hidden good too. The CE comes with 4 playing modes, replayable cutscenes, puzzles, HO's and much more. There are many extras, so it's a worthy CE game! Afterall an absolute Eipix winner and the best game in 2014 until today! Wonderful job Eipix team! Keep it going! Rated 5 out of 5 by Nilosh from Standing Ovation For This One Hidden Expedition: Smithsonian : The Hope Diamond is by far one of my favorite games and now one of my favorite developers has returned with the continuation of the Final Cut storyline. Once again your family is in peril, this time from a twisted serial killer who calls himself “The Director” and is now targeting people connected to your Father, the famous film director, Morton Wolf. After a string of murders over the past six months, a reporter called Michael Harris contacts you with a mission, reveal the identity of the madman who is on a killing spree and stop him before he comes after you. “The Director” has a mission, to pay homage to your father by creating a magnum opus that involves staging each murder to look like one of your father’s films. 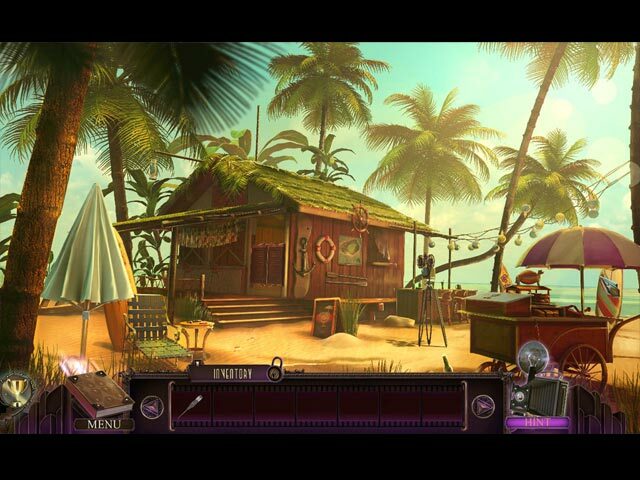 Your father’s projector appears again as a game-play feature, allowing you to switch between real-life scenes and the Director’s movie sets as the fun begins in this brilliant Hidden Object, Puzzle Adventure game. The game had me from the moment the intro began; stunning life like characters, sharp graphics and truly splendid artwork all coming to life with awesome special effects. Voice-overs are well acted and the music in the background offers the right amount of tension to the game. Main menu includes three modes of game play along with customized settings which deserves applause. Extras include replaying of HOPs and Puzzles along with film footages and a souvenir room which is accessible after the game is completed. This game has enough challenge to please even the most skeptical hard-core players. Without the use of black bar hints, sparkles, glints or skips, you really do need to use your brain cells, rely on your memory skills and apply logic in order to solve some of the puzzles. There is a journal along with a map and depending on your difficulty settings, you could either have assistance like map indicators or combining item indicators to make your quest easier. I personally prefer to sweat it out and go in totally blind which makes the game truly challenging. Hidden Object scenes vary and you have your standard list of objects, or silhouettes to locate and/or interactions within the scenes in the in order to collect your inventory item. There is also an item to collect from each scene that I do believe morphs but have not been able to come across this as yet. I noticed it mentioned in the list of achievements. Mini games are a blast to play, very well executed and just the right amount of challenge to prolong the playing time. I loved the rabbit and carrot game at the very beginning which had me stumped at first due to the vagueness of the directions, once having figured it out, I felt like an idiot. I love mini-games that are a bit more creative and require a bit more time solving them rather than just breezing through them. Naturally you have your collectables, clapper boards that are extremely well hidden within each scene and I do applaud the developers for this. Sometimes you have objects to collect that jump out at you and where is the challenge to that? You will love spending time just looking through each scene as they are beautifully designed and surprisingly enough, you will remember some of them from previous games we have played form these developers. There is also trophies to unlock and there is apparently a souvenir room where your special items are collected. I really do think that this time they deserve a standing ovation and applause for this latest chapter. Personally I thing this is one of their best after the first final cut game. The last one was a bit of a disappointment but they now have come up again with a gruesome storyline and terrific animation scenes. I have already pushed the buy button and now am waiting for the complete download. You have everything at your fingertips, offering a great game experience that is not only entertaining, but also challenging enough to make it a must buy. Have a great week-end solving this one! Rated 4 out of 5 by megwoman25 from Review Of Completed Game... I was surprised by how much I liked this game considering I hated the second one. It has lots of extras, achievements and collectibles but also has a solid story line. Of course the story isn't anything new or original but its well done and kept my interest. I even finished the bonus chapter which is a rare thing for me. Usually I am so bored by that point that I uninstall the game but this one I kept returning to. There are clapper boards to find and morphs in the hidden object scenes. There are a lot of achievements but they are the usual fare of completing scenes without hints, getting 5 objects in 5 seconds and playing at least 5 match 3 games instead of hidden object scenes etc. I got most but I am really bad at time related ones especially in Eipix games. 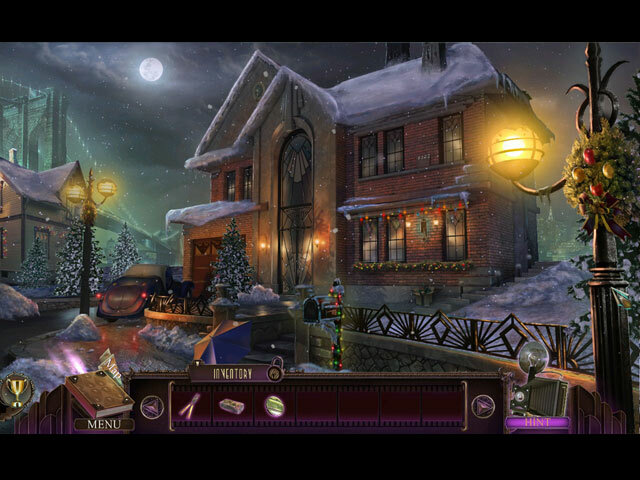 They are extensive searches throughout many locations in a single hidden object scene. Therefore unless you find them all first and then try for 10 in a row in 10 seconds OR play a scene enough times that you can do it in 30 seconds, you are really out of luck. Its very rare that I like to go back and replay hidden object scenes so I didn't get any of those timed achievements. The extras in this game are interesting. I realized that I had never finished a bonus game of Eipix's with this "new" souvenir room as an extra. So what that is, is a room of items and you click on one and it sends you throughout the game you just played, to every location so you can locate ONE item that is shown to you. Some are easy to spot while others are behind other items. I didn't really see the point to this extra but I did do it. I also love Eipix's making of extra as its fun to see behind the scenes this one is interactive and you get to actually build a scene! Then there is the option to play match 3, hidden object scenes again, see artwork etc. The pictures were more fun than normal because it showed the crazy pics they take that are then put into the game and thats what you do in the making of. So make sure you do the making of first because it really puts it in perspective. I liked the extras more than usual. Also you can go back and get any clappers you missed. I only missed one and it was a duh moment. The main plot is somewhat good. It reminded me of the Dorian Gray game from long ago. It has that same madman mentality to it but Dorian Gray is far superior and out of the box. I really did enjoy this game and liked the plot twist although some characters look alike so I got confused but I think thats just me. I recommend this game as a CE although it does wrap up in the main chapter so if extras aren't your thing, you will do just fine with the standard. Kudos! Rated 4 out of 5 by msnslag from Really great game I normally don't review games, but this is so great, that I had to rate this game. Try it !!!!! Rated 4 out of 5 by krystal59 from well put together package I quite liked this one. Unlike some others, I liked the effect with the projector and how you could switch between the locations. Made finding the collectibles harder. I was going to complain in this review that the first game had 4 collectibles including one that was a mystery.. turned out to be cats and they have become less and less with each additional game. But then I played all the add ons after the extra chapter. I liked how you could go back and find what you had missed including the collectibles and the morphing objects that were in some on HOP's. also helped to complete the achievements. Nice touch! I really appreciated that as I hate not completing a game and that really helped me feel like I had totally finished it. This one was well drawn with lots of beautiful locations, a decent though somewhat predictable storyline, good VO's and some darn good puzzles. I also appreciated that the "it's locked, it's missing" thing were not overly done. It was a fairly good length and had lots of extras like siihouette HO's that were progressive, some inventory objects that you had to build and the projector that would change each location. Very good. . I loved the first one and have liked the following two. A few tweaks to the storyline and an extra collectible or two and this would have been 5 star. Rated 4 out of 5 by aysgu from Previous versions were better but still good The game was ok, the quality is very good yet the challenge of the the puzzles were intermediate. I was not satisfied with the CE version and would rather but the SE. It is still a good game but I would recommend you wait for the standard version to purchase it.